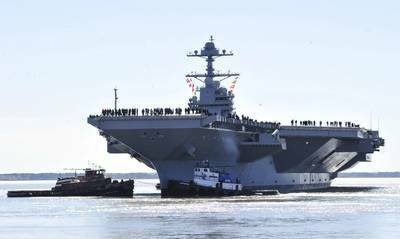 The U.S. Navy asked shipbuilder Huntington Ingalls Industries on Monday for detailed pricing on the cost of two aircraft carriers, showing the Trump administration is taking a serious look at doubling its order for the most expensive ship in the U.S. fleet. The Navy’s request seeks to determine the savings achievable with a two-ship buy. “This opportunity for a two-ship contract is dependent on significant savings that the shipbuilding industry and government must demonstrate,” said James Geurts, assistant secretary of the Navy for research development and acquisitions. Congressman Rob Wittman of Virginia said, “smart acquisition has the potential to save $2.5 billion.” Wittman is on the House Armed Services Committee, where he chairs the Seapower and Projection Forces Subcommittee. Over the last several months the Navy said it has been working to estimate the total savings associated with procuring CVN 80, the USS Enterprise, and CVN 81, still unnamed, as a two-ship buy. Construction of the USS Enterprise began May 2016. The Navy commissioned its first “Ford-class” aircraft carrier, the USS Gerald R. Ford, in July in Norfolk, Virginia - three years behind schedule and billions of dollars over budget. The Ford cost $13 billion. The Navy said it would spend $43 billion in total to build the first three ships in the class, including the USS John F. Kennedy and the USS Enterprise. Buying two ships was a contracting strategy the Navy used in the 1980s when procuring Nimitz-class aircraft carriers. “We believe the most effective way to reduce cost of aircraft carriers is to take a multi-ship purchase approach and build them every three to four years,” said Mike Peters, the chief executive of Huntington Ingalls.